Yes, the time has come Android fans. Starting today, as in now, you can pre-order the highly anticipated HTC Droid Incredible from the Verizon Wireless web site with it being delivered on April 29th. Features of the Android 2.1 device include a 3.7" WVGA AMOLED display, 1GHz Snapdragon processor, HTC Sense UI interface, 8MP autofocus camera with dual LED flash, 8GB of internal memory for storage, Bluetooth 2.1, 3.5mm headset jack, FM Radio,16GB microSDHC support (card not included), Wi-Fi and EVDO Rev A. It also appears that the included HTML browser supports Flash Lite 4.0, something that the Motorola DROID currently does not. 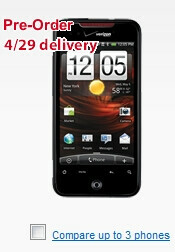 The HTC Droid Incredible is currently $199.99 after a $100 instant web discount with a 2-year contract. Needless to say, I can't wait for the 29th. Let the countdown begin. Agreed! Wish i could get it earlier..
Just pre orders, let the good times roll. Engadget gave this phone a great review all around camera, sound, call quality, speed. I'm excited. Everything you need to know is at Engadget.com if you weren't sold already. How can Verizon reveal, announce, pre-order, and deliver a phone in less time that it takes for Sprint to officially release a phone? The EVO is really going to lose traction to this device if it isn't released soon! At the top there's a drop down of weather You ant 1, 2 or no contract. Hope its there, it usually is for me. Or when you select upgrade it should tell you your not elegible and you can go full retail. Not sure why you'd skip the 2yr VZW is second to none right now. I just pre ordered mine @ 2yr contract....I jacked the wife's upgrade to get it....so stoked. I'm already in a two-year contract. I just wanted to upgrade my phone by paying full retail for it. My Droid is giving me some serious problems, and I don't think I can trade it in for a Incredible. I got the verizon email to pre-order a bit a go, but logging in the site times out. Must be a lot of folks going here to get this phone! Do they usually make public the pre-order numbers like they did with ipad? I'm only paying attention now because I'm way ready for this phone. I am a little surprised big red scrapped the $100 mail in when the saw everyone was going to Best buy. Ha!! From the Engadget Review: "Let's just put this out there: the Droid Incredible is the best Android device that you can purchase in America right now. It's better than the Droid, better than the Nexus One, and certainly beats the pants off of any previous generation handsets like the Eris, myTouch, or Cliq. It's not just a very, very good Android phone (though it is); it's also an excellent smartphone no matter how you cut it. If you're on Verizon right now, you're finally getting really great options for phones, but the Incredible is currently sitting at the top of that heap with a good bit of distance to the next in line. Sure, there are still issues like a lack of quality titles in the Android Market, and if a hardware keyboard is a must, this won't do the job for you. Also, while Sense is truly great on this phone, there may be users who prefer a more streamlined, stripped down experience. Still, if you're looking for an ultra-fast, extremely capable smartphone that has the guts and gleam to go the distance, the Incredible just might be the Droid you're looking for. Yes, we made that joke." Nuff said! I preordered mine at 7am by stealing the upgrade eligibiilty of my 12yr old niece's line. Excited about getting this phone! I've already been downloading and saving a lot of apk files to my MicroSD Card so as soon as it arrives next Thursday, it'll basically be plug n play. One thing I've noticed a discrepency on is the RAM. One spec sheet says 512 MB, another says 564 MB. I know 52 MB is not a big deal for RAM in the long scheme of things, but if there is a discrepency on that, could there be other discrepencies? Just curious.